1. Installation work and electrical wiring must be done by qualified person(s) in accordance with all applicable codes and standards, including fire-rated construction. 2. Sufficient air is needed for proper combustion and exhausting of gases through the flue (chimney) of fuel burning equipment to prevent back drafting. Follow the heating equipment manufacturer’s guideline and safety standards such as those published by the National Fire Protection Association (NFPA), and the American Society for Heating, Refrigeration and Air Conditioning Engineers (ASHRAE), and local code authorities. 3. When cutting or drilling into wall or ceiling, do not damage electrical wiring or other hidden utilities. 4. WARNING: To reduce the risk of fire or electric shock do not use with an extension cord. Please read and understand this entire manual before attempting to operate or install the product. 1) Use fan only for intended use, as described in instruction manual. Other use may cause fire, electrical shock, damage to the unit, or injury to persons and will void any warranty by the manufacturer. 2) To protect against electric shock, do not immerse unit, plug, or cord in water or spray with liquids. 3) Close supervision is necessary when any appliance is used by or near children. 4) Unplug from outlet when not in use, when moving fan from one location to another and before cleaning. Turn the unit off before unplugging. 5) Never insert any object or allow any object to enter the EntreeAir® through the grills, as this may damage the unit or cause it to malfunction. 6) Pressure on the grills of the EntreeAir® may cause the fan impeller to contact these grills and damage the unit. 7) Disconnect fan before cleaning. Do not use strong detergents or flammable liquids to clean the EntreeAir®. 8) The motor of the EntreeAir® is equipped with a thermal fuse. Blocking rotation of the fan or airflow may cause the motor to overheat. Should the motor overheat and the fuse open, replacement of the motor is required. 9) Do not in any way block the air grills of the EntreeAir®. 10) Do not use fan in a window. Rain may cause an electrical hazard. The EntreeAir® should never be exposed to moisture. Do not use the unit in a bathroom or laundry area where it may come in contact with water. 11) Do not operate in the presence of explosive and/or flammable fumes. 12) Do not place fan or any parts near an open flame, cooking or other heating appliances. 13) Do not operate any appliance with a damaged cord or plug, after the appliance malfunctions or has been dropped or damaged in any manner. 14) To disconnect, grip plug and pull from wall outlet. Never yank on cord. 15) The housing of your EntreeAir® is sealed at the factory. THERE ARE NO SERVICEABLE PARTS INSIDE. Attempting to open the housing will expose you to dangerous electricity, may cause fire, and will void any and all warranty. 16) The EntreeAir® is designed for indoor use only. 17) This product is intended for household use only and not for commercial or industrial use. 18) Do not use fan near curtains, plants, windows treatments, etc. 19) Do not operate any fan with a damaged cord or plug. Discard fan or return to an authorized service facility for examination and/or repair. 20) Do not run cord under carpeting. Do not cover cord with throw rugs, runners, or similar coverings. Do not route cord under furniture or appliances. Arrange cord away from traffic area and where it will not be tripped over. 21) WARNING: To reduce the risk of electric shock and injury to persons, do not use this fan near a door or window. 22) WARNING: To reduce the risk of fire or electric shock, do not use this fan with any solid-state speed control device. NOTE: This appliance has a polarized plug (one blade is wider than the other). The polarized plug is not intended to be used in non-polarized outlets (having both slots the same size). To reduce the risk of electric shock, this plug is intended to fit in a polarized outlet only one way. If the plug does not fit fully in the outlet, reverse the plug. If it still does not fit, contact a qualified electrician to install the proper outlet. Do not attempt to modify this plug or override this safety feature in any way. 1. Never pull or yank on the cord or the appliance. 2. To insert plug, grasp it firmly and guide it into outlet. 3. To disconnect appliance, grasp plug and remove it from outlet. 4. Before each use, inspect the line cord for cuts and/or abrasion marks. If any are found, this indicates that the appliance should be serviced and the line cord replaced. Please return it to an authorized service representative. 5. Never wrap the cord tightly around the appliance, as this could place undue stress on the cord where it enters the appliance and cause it to fray and break. This product employs overload protection (fuse). 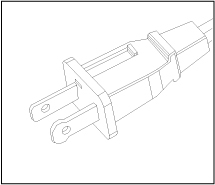 A blown fuse indicates an overload or short-circuit situation. If the fuse blows, unplug the product from the outlet. Replace the fuse as per the user servicing instructions (follow product marking for proper fuse rating) and check the product. If the replacement fuse blows, a short circuit may be present and the product should be discarded or returned to an authorized service facility for examination and/or repair. 1. Unplug your fan. Grasp plug and remove from the receptacle or other outlet device. Do not unplug by pulling on cord. 2. Open fuse cover, located on the top of the plug, by using your thumb or a flat head screwdriver to slide the cover down toward the prongs. NOTE: Ensure the fuse cover is completely open before attempting to remove fuse. 3. Remove fuse carefully by using a small screwdriver to pry the fuse out of the compartment by the metal ends of the fuse. 4. Place plug on a solid, flat surface. Insert new 5 Amp, 125 volt fuse into fuse compartment and use a small screwdriver to secure the metal ends of the fuse into the compartment. CAUTION: Risk of fire. Replace fuse only with 5 Amp, 125 volt fuse. 5. Slide fuse cover closed. 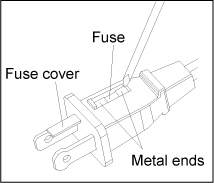 If fuse cover is difficult to close, make sure fuse is secured in place by pressing down on metal ends of the fuse. 6. Risk of fire. Do not replace attachment plug. Contains a safety device (fuse) that should not be removed. Discard product if the attachment plug is damaged. DO NOT OPERATE APPLIANCE IF THE LINE CORD SHOWS ANY DAMAGE OR IF APPLIANCE WORKS INTERMITTENTLY OR STOPS WORKING ENTIRELY. IMPORTANT: During the first few minutes of initial use, you may notice a slight odor. This is normal and will quickly disappear. Before cleaning the EntreeAir® always disconnect the power cord from the outlet. Dust may be removed from the exterior surfaces using a soft cloth, the round brush attachment of your vacuum cleaner, or using a cloth that has been lightly moistened with water and a mild non-abrasive detergent. Dust accumulation in the interior of the EntreeAir® may be removed by using the round brush attachment of your vacuum cleaner. What will the EntréeAir® do for me? The EntreeAir® is designed to be mounted in a doorway and move air from one room to another. Why would I want to move air from one room to another? If you have a fireplace in one room, you may want to share some of that heat with an adjacent room in the winter. Similarly, if you have a window air conditioner in one room, you may want to blow some of that cooled air into an adjacent space. The EntreeAir® is also very effective in maintaining some airflow into a room that seems stuffy. How much air does the EntreeAir® move? The EntreeAir® moves approximately 100 Cubic Feet of air per Minute (CFM). To put that in perspective, a 12' x 18' room contains about 1700 cubic feet of air. At 100 Cubic Feet per Minute, divide the room volume by the 100 CFM, which gives approximately 17. That means the entire air volume of that room is moved every 17 minutes. How much electricity does the EntreeAir® use? The EntreeAir® uses 20 Watts of electricity. Like a small light bulb. How do I install the EntreeAir®? The EntreeAir® mounts on the doorframe. There are keyhole slots in both straight sides of the unit. Simply install two screws in the doorframe and hang the EntreeAir® with the keyhole slots over these screws. Can I control which direction the air flows? Yes, because the EntreeAir® has two sets of keyhole slots, you can hang it blowing into or out of a room. How quiet is the EntreeAir®? Very quiet. The sound level is 50dBA, about the same as the fan of a desktop computer. Visit the quality control page. The power cord is 10 feet long and has an in-cord on/off switch. 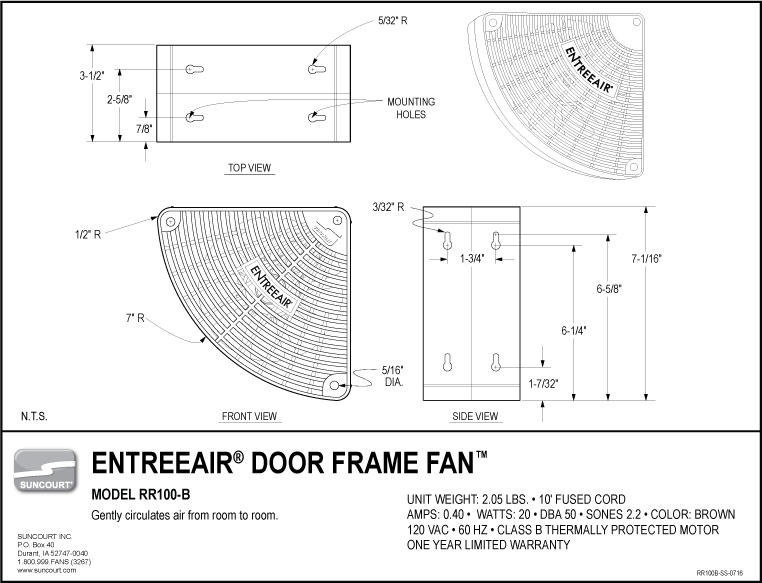 Can I close the door with an EntreeAir® installed? Yes. The EntreeAir® mounts beside the wood doorstop strip, opposite from when the door closes against. How do I clean my EntreeAir®? Your EntreeAir® will accumulate some dust over the years. Simply blow out that dust occasionally or use a small brush or cotton swabs to clean the interior. Never open the housing of your EntreeAir®. This will void the warranty and constitutes a serious safety hazard. Operating the EntreeAir® in a clean household and changing the filter of your central air system regularly will help keep the EntreeAir® clean. Can I run the EntreeAir® continuously? Yes, the electric motor is designed for many years of continuous operation. Yes. Conforms to ANSI/UL Standard 507 & Certified to CSA C22.2 No. 113. The housing is made of a flame retardant ABS material. The electric motor is a Class B, Thermally Protected motor.